Yggdrasil Gaming is one of the best gaming developers in the industry. It has managed to grab its spot on top of the list because of its new games. The developer is always releasing new titles into the market to keep its portfolio fresh. The latest game to be added to its rich portfolio is Superheroes. This new game has a 5 reel setup that homes a total of 20 wagerlines. The game has a superhero theme that focuses on 6 superheroes that players will join. These superheroes will not only make the players’ stay at the game fun and exciting. This is because they can interfere in the game play, use their powers to help players get rewards. Superheroes by Yggdrasil Gaming has a five reel setup, which is the host for 20 betlines. Players are going to place their desired wagers on these lines underneath the reels. They will toggle between the different wagering options to determine their final bet. There is also an expandable button on the left that would open more settings such as the paytable, the sound options and more. The game also has an auto play function that players can activate. This way, they can sit back and relax while claiming the rewards as the reels spin. Superheroes invites players to join 6 superheroes in a great gaming adventure that is full of rewards. These six heroes are Knox, Trance, Tesla, Hopper, Raven and Mirage. Each superhero has his/her own special ability. These special abilities are shown during the superhero feature. They will use their abilities to manipulate the symbols on the reels, which will result in great prizes for the players. The game takes players on that adventure in a futuristic setting. This is why players will see that the game takes place on a platform among high skyscrapers. Even the buttons, the reels and everything about the game feels futuristic. Other than the 6 superheroes that players will see across the reels, there is the wild, the free spins icon and mysterious emblems. 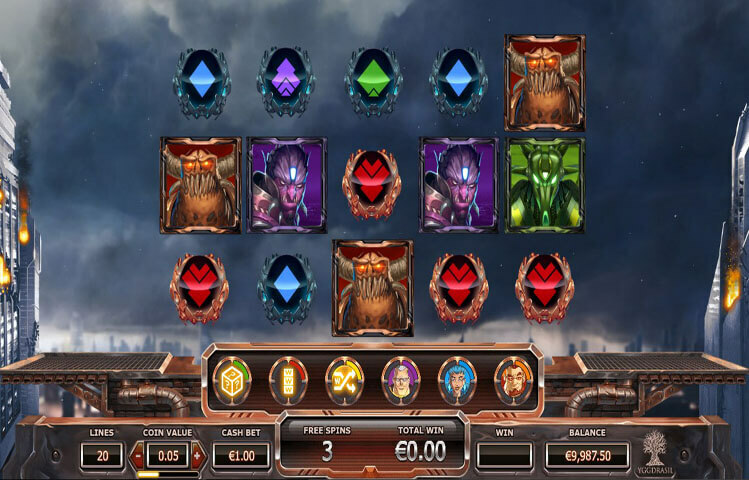 Like any Yggdrasil Game, the slot has a wild icon. It is the flaming yellow wild icon. This symbol would replace other icons on the reels. It will do that in order to create the biggest payout. The only symbol that it will not replace is the scatter Free Spins icon. Speaking of which, 3 of these free spins icons at least will activate the free spins round. Players will claim from 4 to 7 free spins. During which, the superhero feature will be active. They start at level 1 and can level up to level 4. The Superhero can get into the game play randomly during the base game as well to manipulate the symbols and help players get paid.